This post is mostly a stream of consciousness and some shoes I like. It has opinions. Which is pretty much an embodiment of all the stuff I hate about wedding shoes. They often seem to have that shape - elongated and pointy at the toe, stiletto heel that's not high, boring back and strap. Not only are these fabric-covered, but also embroidered! Lumpy. Other types are mostly strappy heels, which I also don't like. My toes are not for public display. I suppose these heels would be comfortable, which is a massive plus on a day when you don't want to get sore feet. I know some women get the shoes covered to match their gowns, and I agree that it's a nice idea. But by the same token, there are lots of amazing normal shoes that I'd love to have for my wedding. Normal shoes might be better because you can actually wear them again. Normal shoes won't be damaged forever if you get them wet or *gasp* muddy. 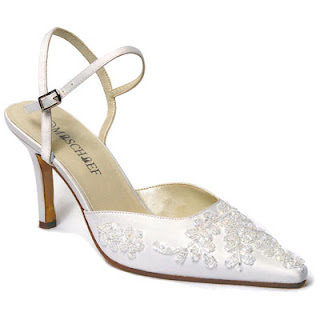 Ideally, I would like these Baby, The Stars Shine Bright shoes for my wedding. They're the Princess Drop Chandelier shoes or something like that. They're out of stock everywhere. I think I saw them in Paris but never bought them :-( Silly. I love the gold filigree touches. A very elegant shape too. So today I was browsing Yumetenbo - a site I often browse but have never bought from. It's all in Japanese. Some girls can manage to navigate well enough to buy but I'm not that confident yet. I found some lovely shoes I'd totally wear to my wedding (or anyone else's)! The great thing about this online store is that a lot of the shoes are available in many colours! Click on the pretty pictures to go to the websites! Probably these would be good in beige or white, depending on the dress colour. I love double straps - super cute. Just simple Mary-Jane pumps. SO MANY COLOURS. These would go with any outfit. I love these. So simple and elegant. 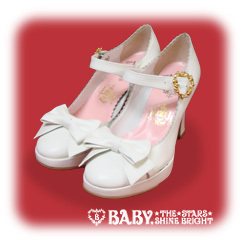 The bow is detachable so you can wear them as normal pumps or as cutie cute cute pumps! These have an interesting wedge heel. I think it's totally weird but also awesome! Plus, more double strap action! I'd get it in pink or in spots! These shoes are just gorgeous. I'd be almost as tall as Charles in these! I love the red shoes best. Most of my wardrobe is red or black. Oh dear! It just occurred to me! Maybe I just love the shoes because the models are so cute! Look at them! Awwwwww! Choosing your wedding shoes doesn't have to be stressful, but when choosing the bridal shoes you'll want certain things in thoughts.